"A memorable day off the beaten path on America's Public Lands"
This post was created in one hour for #NatureWritingChallenge hosted by Douglas Scott on Twitter. I'm not sure how to approach the topic of "off the beaten" path without immediately thinking of my most recent trip to various public lands on the Olympic Peninsula in the great state of Washington. Many of the places I visited had well worn paths that could probably use a break, but there were a few special places that seemed a bit less visited and allowed visitors like me to fully unwind and fully appreciate our Public Lands. Many people visit the Storm King Ranger Station at Olympic National Park. I'd be willing to bet that many people visit Marymere Falls, which is ranger station adjacent, as well as hike the Mt. Storm King trail. I don't have statistics, but the Marymere Falls trail was well used and was easy to follow, even up the hills to the waterfall viewing. Mt. Storm King, while abrupt with elevation was also well used until the "end of maintained trail" marker near the top. I made it to that marker and thought I was on top of the world. Then, I saw a faint path that went past the sign and looked at my map to see what was up. I'm not experienced with any hills over 700 feet, let alone a mountain, but I assumed people continue on and climb to the top to get a better view. A quick internet search led me to numerous photos from the top and my newfound desire to get up there to see what all the fuss was all about. 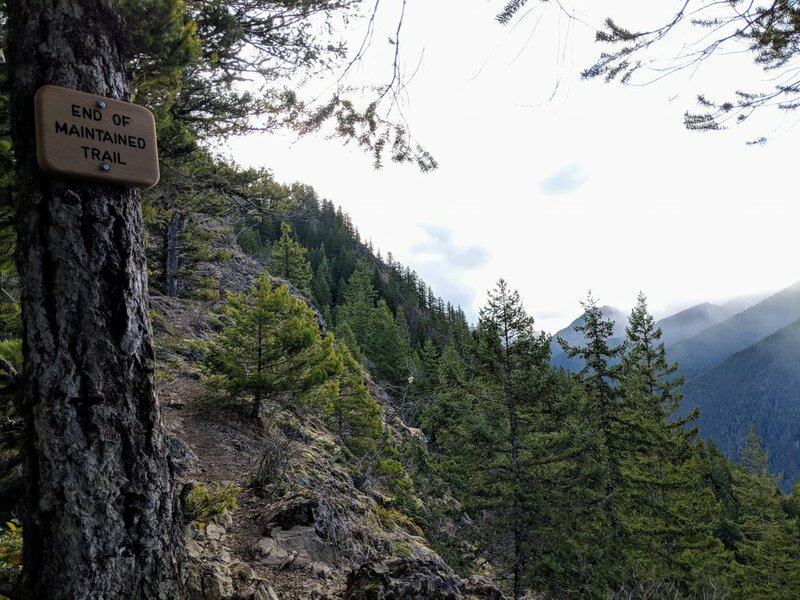 I started inching past the tree with the "end of trail" sign on it, plotting my path and making sure I could safely climb back down. I moved 20 feet, stopped and admired the view, moved another 20 feet and did this until I just didn't feel safe anymore. It was still earlier in the morning, there was no one around, and I had an almost top of the mountain to myself. I saw Lake Crescent in the distance, a rainbow through the clouds, and mountains covered in trees. Despite not being able to go all the way to the top, I felt accomplished. I have never climbed that much in elevation in that short of a distance, I've never had views like I did from there, and I certainly haven't haven't felt ice pelt me in the face while staring at a rainbow. I'm not the most physically fit person, so it was a personal victory for me to get up there without quitting. I was overwhelmed with emotion, in a good way, and I had a few tears while laughing and catching my breath. I didn't feel unsafe, stressed, or upset about anything. I felt free, happy, accomplished, and motivated. I sat there for a long time, staring out and up and taking in every moment as if it were the last thing I'd ever see. If I wasn't already in love with the area and park, my heart would have melted right there on that ridge. I was smiling ear to ear the entire journey down to the trailhead. The mountain may have boosted my confidence and lifted my spirits, but the beach helped me truly let go of anything weighing me down. 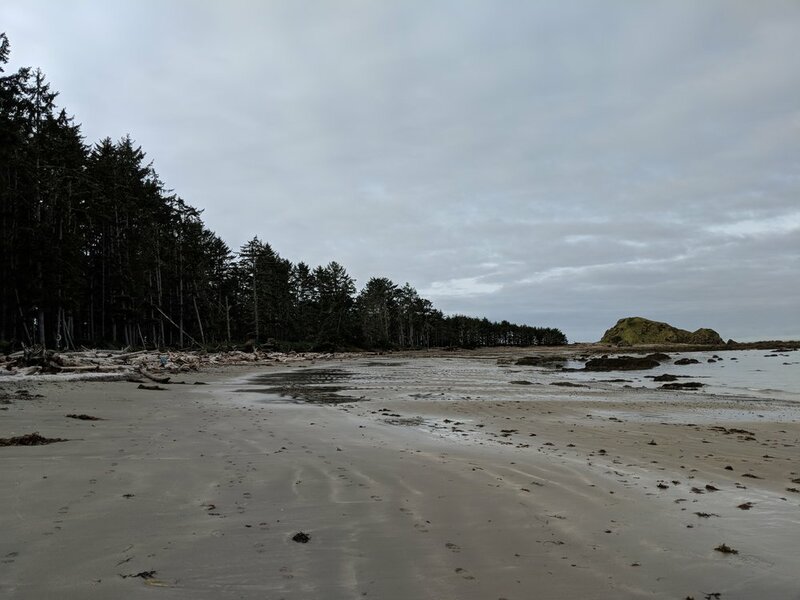 I drove out to Ozette and hiked the Ozette Loop on a coastal portion of the Olympic National Park the next day. The boardwalk and path to the ocean, through what felt like a temperate jungle, were well worn and beautifully maintained but once you hit the beach, it is just you and that ocean. Sure, there were a few tide pools, rocks, and fallen timber, but for the most part it's just you and the ocean. While walking from Point Alava to Sand Point, I ran into one small group of people and a few birds. There was no path on the beach, just sand. You walk along, alone for the most part, listening to the waves crash on the rocks. The sensation of being free, following only a coastline, and being in one of the most pristine places on west coast was enough to make my head float. I was gone, my thoughts were gone, and I was free. I walked along, staring into the tide pools, hopping over logs, and dodging whatever seaweed stayed behind on land after high tide. The three miles from point to point was a moment of zen or clarity or whatever you want to call it. Olympic National Park rejuvenated my soul and assured me that I can do the things I want in life - like climbing mountains. I have spent more time on the beaten path, but those little moments off have really allowed me to experience raw feelings and be at peace with myself more than any trail has in the past. I'm forever grateful for our Public Lands and will continue to seek the places off the beaten path.